Daniel 1st March 2018 2nd August 2018 No Comments on Why use our labels for nursing and care home residents? If you have a family member or friend that you care for who is currently staying at a care or nursing home you will know how important labeling their clothes are to prevent any unwanted lost and them becoming upset and distressed, this also applies to a person who may also be due to move to the aforementioned shortly. Most clothing isn’t cheap and in both care and nursing home environments there are usually many residents and this means a lot of washing is being done at any one point, this makes it important to have clothing labeled. When it comes to labels for care or nursing home residents it’s important that they are durable, have a clear print and display the resident’s name and any optional details you may also like printing. Other important features should be label sizing, we currently provide both 10mm and 25mm label sizes, along with sizing is whether they are iron on or sew in labels and we only provide the latter which is due to them not falling out of clothing when an item is washed and this is something iron-on labels can, unfortunately, suffer from. You may want just want a name in a simple bold black ink printing onto the ribbon, this is fine and is actually one of the most common types of name label we produce in either 10mm or 25mm sizes. Additionally, you can also include a room number, care or nursing home name e.g. Pinetree Care Home and even optional additional contact and/or medical information on the rear of the label. Additional information can be handy in situations where the resident may become lost or a loved one should be contacted in case anything has happened. Of course, we also offer a full range of fonts, print colours and little motifs which all can allow you to truly personalise the name labels so plain black labels although serve a purpose aren’t the only thing we can offer you. Our sew in care home labels can be placed inside virtually any type of clothing, and because they are sewn in they won’t come out unlike cheaper iron on name labels. Now onto one of those most important parts of our name labels, they durable, very durable! 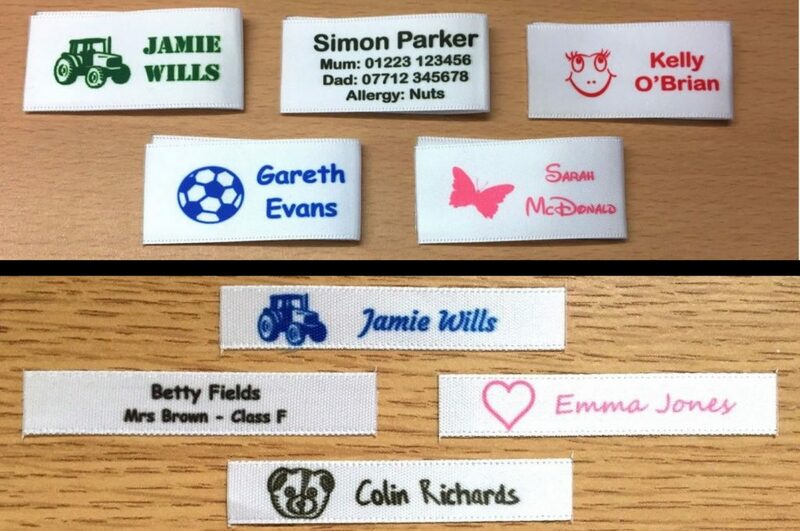 We produce all of our own name labels in house using a bespoke developed process that allows each label to be washed in hot temperatures and in both bio/non-bio washing detergents with no adverse effects, unlike cheaper similar-looking alternatives. In fact we have even tested our labels in concentrated bleach with no problems, this wouldn’t normally happen but it just goes to show they won’t fade or discolour and this is important because they need to last a long time. Additionally, we only use super soft double sided satin ribbon, which means our labels won’t irritate the wearer’s skin unlike cheaper woven name labels and provide a luxury feel when handled. Primarily we produce name labels for both school and nursery children along with hobby and craft businesses, over the years we have made thousands of name labels and shipped them to many hundreds of happy customers and our feedback reflects this.